【The Latest Android 7.0 System】Equipped with Android 7.0 System, P8I provides you a stable and smooth OS combined with 1G RAM and 8G ROM, you can not only enjoy amounts of online movies, pictures and games, you can also download Apps like Netflix, YouTube or save videos and files directly to the projector! 【WiFi Wireless Connection for Multiscreen】P8I supports 2.4G & 5G dual-band Wi-Fi up to 1000M/s for more stable and convenient connection. Through WIFI connection function, you can easily connect your smart phone/tablet to the projector for multiscreen mirroring by Airplay(for IOS) and Miracast(for Android OS) or by the Eshare APP. Please note that the projector and your devices need to connect to the same WIFI. 【Advanced Technology for Better Viewing Experience】Adopted the advanced DLP 0.3" DMD technology and 854*480 native resolution compatible with 1080P, P8I shows clear lifelike(1000:1 contrast ratios) and high brightness(100 ANSI lumens) images for you. 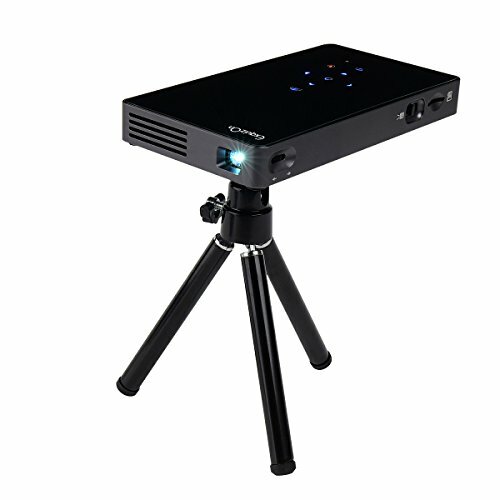 What's more, the projector comes with a convenient function: auto keystone correction, it can detect the vertical angle automatically and give you the right rectangle image in just one second! 【Bluetooth 4.0 & Rich Interfaces】With built-in Bluetooth 4.0, P8I is easy and convenient to connect the projector with different devices like mouse, keyboard, speakers. Besides, there are also many interfaces: HDMI(for computer, DVD player, laptop, game console etc. ), 2*USB(for USB-Stick), 3.5mm jack(for headphone, speaker) and TF port(for TF card) for movies, games, presentations, and photos! 【Super Large Capacity Built-in Battery】With a powerful 4500mAh built-in rechargeable battery, it can also be a power bank for your smart phone or tablet for emergency use!